Google is introducing the self-driving bicycle in Amsterdam, since the Dutch cycle an average of 900 kilometers (560 miles) per person per year. To see the remarkable technology behind this urban mobility breakthrough, look here. Spain bested Netherlands in an overtime World Cup match. The Dutch team had been undefeated in 25 previous contests. 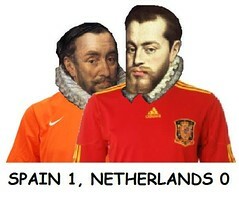 Perhaps this was payback for Holland’s defeat of Spain in the Dutch War of Independence (1648). The final match of the 2010 World Cup will be played shortly. 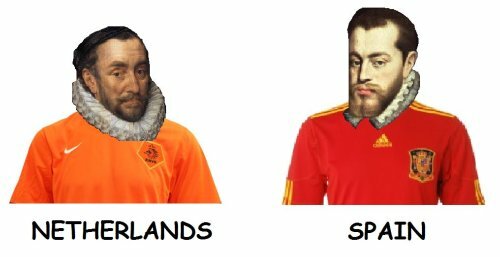 The competitors, The Netherlands and Spain, have a history. Lots of history, chiefly the overtime contest called The Eighty Years War or Tachtigjarige Oorlog (1568–1648). The war began under the leadership of coaches William of Orange on the Dutch side, with Philip II coaching Spain. The outcome? Hint: the struggle is also called the Dutch War of Independence. Back to today’s match: neither side has won the World Cup in the entire history of FIFA competition. How long is that? Eighty years.